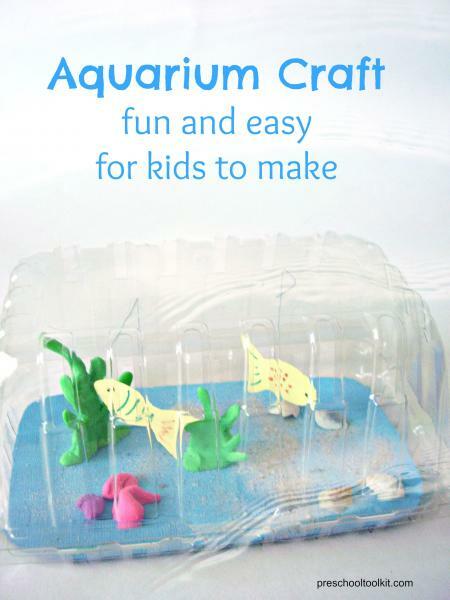 Kids will have fun making this beautiful aquarium for their goldfish – or maybe a bigger fish! Materials include blue paper, modelling clay, thread, plastic berry box, seashells or colored rocks, tape, glue stick and a little sand from the sandbox. There are so many wonderful choices available in craft or sewing stores, or even dollar stores. The two papers shown here come in a variety of shades of blue and have wonderful textures that are perfect for water/ocean crafts – raised bubbles (bottom) or ridges (top). Draw and cut out small fish and color them with markers or crayons. Tape one end of a length of thread to the side of a fish. Tape the other end to the top of the berry box. Close the box lid to see if the fish is swimming at a suitable distance from the bottom of the aquarium. If you need to adjust the height of the fish, gently pull on the end of the thread and it will slide through the tape. 1.Cut a piece of blue paper to fit the bottom of the berry box. 2. Shape modelling clay into sea plants and corals. 3. Spread some glue onto the blue paper with a glue stick. Kids can pinch sand between their fingers and sprinkle ir over the glue for a great fine motor activity. 4. Glue sea shells or colored stones onto the blue paper. 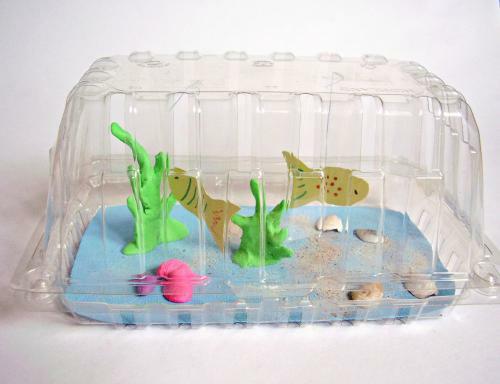 The options for completing the aquarium are endless – use different materials for the bottom of the aquarium, the fish cut-outs, and the accessories. Sensory play is extended by using different colors and textures. Heather is the creative mind behind the wonderful Preschool Toolkit blog where she writes about creating exciting hands-on experiences for early learners. You can also find her on facebook and pinterest. This is my kind of aquarium…no cleaning required!